I was asked by a former colleague turned administrator to “email a list of what you do with teachers” so he would have “somewhere to start” with his new, first year instructional coaches. I am no seasoned professional, this will be my second year as a K-8 instructional coach, and I had TONS of help getting started last fall. I decided I would “pay it forward” and sent him a three page document he could share with his new coaches. Here’s the text of the document I sent. I’m still learning, so please help me out and let me know if you have any other advice you’d offer to new coaches or principals working with them. I’d appreciate it. Almost every day is different for me, especially since I’m in two buildings. I have come to rely heavily on my “Time and To Do Planner” (see www.mshouser.com). Typically my first 20-30 minutes is time for me to check my schedule, respond to emails, and/or touch base quickly with teachers or principals. After that, I could be doing any number of things. Here’s a basic list. *Sometimes I lead a lesson either to model for the teacher, or because we planned a unit together and I begged the teacher to let me lead a few lessons. This is a big chunk of my day. Sometimes these meetings are planned, but often they are not. I love my room at Hospers where teachers feel free to pop in and talk. We talk about all sorts of things: units and lessons, essential questions, student accountability, behavior concerns, curriculum, assessment, technology, etc. Sometimes these meetings are a part of a “coaching cycle” where we are working through a unit together, but more often they are just a quick meeting to figure something out. This is another big part of my day. I love that I have the time to search for or create something for another teacher. Sometimes I work short term with students either one on one or in a small group. This helps me get to know the kiddos so when I’m talking with a teacher and understand their concerns. I have also done some diagnostic testing with a few students. 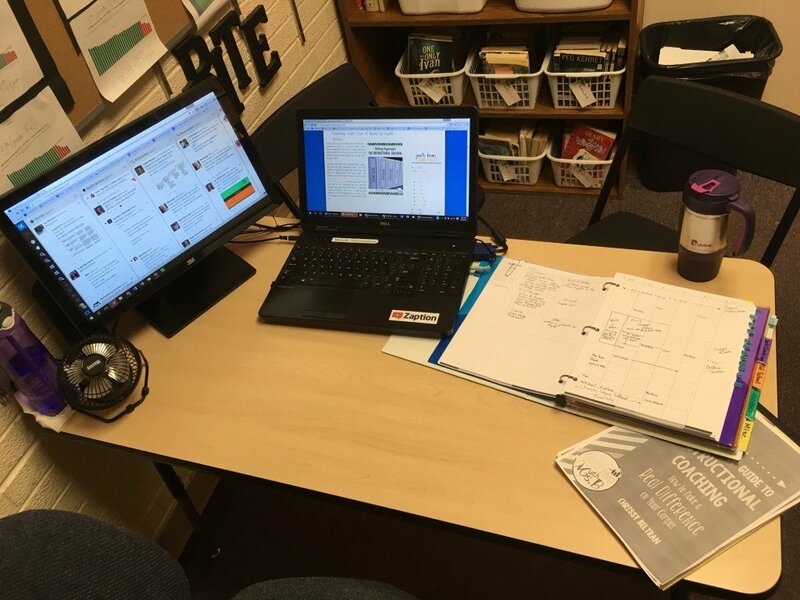 I have the time and resources to dig in and see if I can figure out where the gaps are and then begin to offer possible interventions that can be utilized in the classroom. I have also helped out with writing projects–taking a few kids aside to work through editing and revising. I typically help most of the K-5 classrooms with SOME of their fluency testing. They usually give me 5-10 kids that are solid readers so I can get through them quickly. Once in awhile they’ll give me a kiddo that they are worried about just to have another set of ears listening to them read. If a teacher is sick (or on maternity leave) I also help with their weekly progress monitoring. This is a big one. We meet just about every week for 30-60 minutes. We typically talk about curriculum, data, assessments, and I share some of what I’ve been working on. I bridge the gap between teachers and admin. I HIGHLY recommend that principals and coaches meet on a regular basis. About once a quarter, the four of us get together and talk about what we’ve been doing, sharing ideas, concerns, and celebrations. It’s our “support group” time and we often do this over our lunch. One of my jobs is to LEARN and stay on top of what’s new. I typically have at least one webinar every month or two. Besides learning how to use some new tech tool, Marzano’s research group puts on a few good webinars and (found through Twitter) there are several others that put on instruction focused events. Our local AEA hosts monthly professional development meetings for teacher leaders. Last year they were all really good and provided a chance to network with other coaches from around the area. I go to a lot of PLC meetings. My role varies in those meetings, but mostly I’m there to offer support. Often I’m able to answer questions or I write them down and go and find the answers. Sometimes I’m leading part of the meeting as I am asked me to share things. Most of the time, teachers come to me with a question and by just thinking through an issue out loud, they figure it out themselves. I just nod, rephrase some of the things I hear them say, and once in awhile ask them to “tell me more about that.” Overall, they need to know that I am on THEIR side, a colleague who can be trusted. Also, I avoid using the word “help” unless the teacher specifically says, “I’d like your help.” Instead, I use the word “collaborate”. “I’d love to collaborate with you on that!” Steve Barkley had a post about that last year. GET AND USE A TWITTER ACCOUNT! Follow #educoach and try to participate in the Wednesday night chats if you can. Follow #iaedchat and try to participate in Sunday night chats. You might need a few “forms” to help you get started, but don’t get hung up on them. Soon enough you’ll begin feeling comfortable and won’t need forms, but keep a good notebook or legal pad handy at all times. Never leave your office without your planner. Never. Seriously. That quick trip to the bathroom? Someone will stop you and ask you to visit next Thursday at 2:00. Guaranteed. You’ll probably say, “sure” and find out that you are busy at 2:00 on Thursday and have to reschedule. Done it too many times to count the first few weeks until I learned to just carry it ALL the time. Use any “down time” to learn. You won’t have much of it, but when you do, actively seek out your own professional learning. Get comfortable with just popping in to classrooms. Not a bad idea to mention to teachers in the morning (“I would love to just visit for a bit this morning…”), but then make time once in awhile to just visit several classrooms. You need to know what’s going on and teachers will eventually just get used to seeing you. That in turn leads to being seen as a colleague, which leads to opportunities to collaborate. My first year was a roller coaster–lots of ups & downs and loops, and a TON of fun! I really was busy all year, with only a few days where I felt like I had time to just breathe, catch up on my “to do” list, and learn something on my own. Now, as I begin year two, I’m even busier! I had no “planned” meetings on Friday afternoon and hoped to check on the FAST/Iowa Teir system, but walked down the hall once and had four people catch me and say they needed me to stop when I had time. I was swamped all afternoon. Last fall I spent time writing names on things for people, just to open the door, this year, my to do list is full already. Posted on August 21, 2016 by mrstg • This entry was posted in Instructional Coaching. Bookmark the permalink. You could start by going through my list of instructional coaches that I follow. Here’s a link: https://twitter.com/MrsTG/lists/instructional-coaches/members Also, follow the #educoach hashtag on Twitter (https://twitter.com/search?f=tweets&vertical=default&q=%23educoach&src=typd). And sorry about the outdated blog. It’s kind of a “bad news/good news” thing. Bad news is that my blog is out of date. Good news is that I’m so busy as an instructional coach (and a MOM) that I don’t have time to update it. Being busy has been FUN and invigorating! Good luck on your goal! I hope you make it! Realizing this post is from last year, I still have a question. I have a goal of becoming an instructional coach. I was wondering what do I search on twitter to find instructional coaches? I think that is a really great idea.